Simon, is known as one of the most prominent and successful property advisors along the coast. He understands what it means to 'future-proof' exceptional residential developments as he has sold the skyline from, the glamorous Hamilton Island in the far north down the coastline of Queensland to Broadbeach Gold Coast, through his senior involvement at Juniper and his family realty firm, G1 Property Mooloolaba. The experiences of handling every major high-end development in the Mooloolaba precinct since 1999 (before the last property boom) including Mooloolaba International, Zanzibar, Sirocco, Oceans, Waves, Platinum, Riva, and Sea Pearl, arguably the stand-out performer during the GFC period, totalling sales in excess of $1 billion. Discovering the real estate industry over 20 years ago on the Gold Coast when attending Griffith University, Gold Coast, he then relocated to the Sunshine Coast in 1999 to holding a senior management position with a nationally renowned private developer. His passion for real estate translated into the creation of G1 Property Mooloolaba, established in 2004, which he subsequently drove to be known as the most successful independently owned realty agency based in Mooloolaba, Australia. 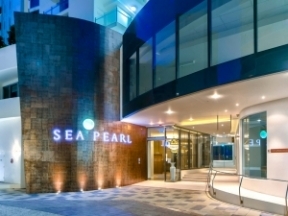 This has been the catalyst to many project marketing & development successes in particular the sell-out of the $70 million luxurious Sea Pearl in 2014, and 2015 launch of the $35 million First Light Mooloolaba development, which was the brainchild of Simon's company the Guilfoyle Group, achieved 80% sold in 6 months. "Guilfoyle's core business is asset management, developing residential project concepts with sales & marketing strategies and leading teams to achieve unmatched results," said Simon. Simon's enthusiasm for the business is unwavering and he has achieved many record sales particularly in the prestige unit market and now in the house market and the team he leads arguably forms one of the most dedicated and experienced Project Marketing, Sales, Commercial, Permanent & Holiday Rental boutique real estate firms on the Sunshine Coast. Simon said "You know, we strive to reach and surpass our clients expectations, whilst delivering the highest level of professional service and real-time sales results." Simon's whole approach is intensely focused, researched and 'result' orientated and the outcome, he is a high achiever when it comes to negotiating and managing the wants and needs of both purchasers & sellers. Going as far back as his Australian Schoolboy Rugby days, he has always been a success magnet with a competitive edge and a range of techniques and abilities that simply can't be repeated. "We're totally focused and dedicated to making our businesses a success through helping our clients become wealthier in terms of lifestyle, monetary investment or preferably both," Simon said. "You know we're at the front-line of the coast's real estate market so I guarantee we're constantly reviewing the property market and or developing our brand appeal by looking for business opportunities which will enhance our long-term central Sunshine Coast asset strategy!" "We are very conscious of the premium positioning of our brand to the next generation of luxury lifestyle property market and travellers seeking a prime river or beach precincts to base themselves during their holiday or permanently. Successfully for 15 years (EST.June2004), our company's edgy G1 branding has been clearly identified by our clientele. Hence why we can boast repeat and referral business success of around 40% and increasing." Contact me today, to discuss your property requirements and together we'll engineer a solution exclusively. Unit | PERFECT EMPTY-NESTERS SKY-HOME! | P.O.A.